today kevin's baby sister turns 20! happy birthday staci! 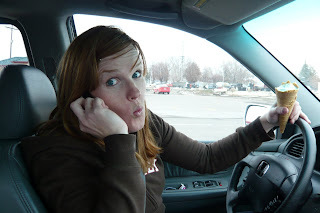 you are such a fun-loving, laid back, thoughtful, beautiful, and an outgoing gal...and we love you! it's been so fun having you so close to us and we will miss you this summer when you leave. owen and wesley just adore you! we hope you have some extra fun plans for today...and knowing you, you probably do! happy birthday! happy birthday to one of my most talented sisters...emily! 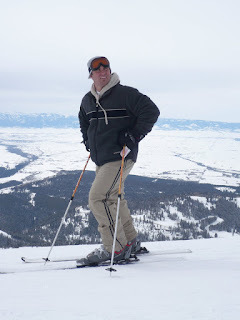 i am doing this post from snowy logan, ut today so i am using a picture i have posted before. but, it's still a cute one of ya em! hope you had a great week celebrating in las vegas and that you have an extra special day today. can't wait to see you this morning at megan's baptism. happy birthday! today my grandma eva turns 90! my grandma is an incredible woman! 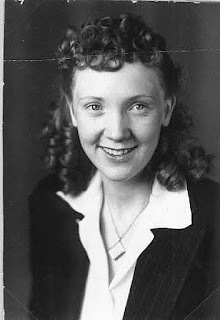 i have so many wonderful memories of my grandma. you will never meet a more fun-loving, energetic, active, beautiful 90-year old woman. she is always up for a card game or a late night visit (and i mean late). i am always so proud when people ask if i am related to her and i have never met a person who didn't love her. 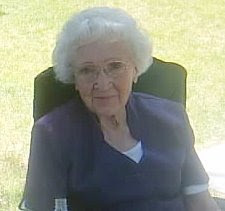 i couldn't tell you how many grandchildren and great-granchildren she has (although she could...she remembers every single one of us) but...all together it's a couple hundred...at least! what a legacy! happy birthday grandma! thank you for being such a wonderful example in every aspect! i love you! it seems like last night was the first time i have actually been WOWED since american idol started this season. 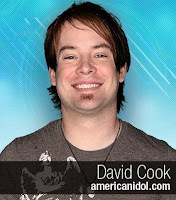 we had to listen to david cook's rendition of billy jean twice because we couldn't believe what he did with the song. LOVED IT! this guy will sell records whether he wins or not. believe it or not, the easter bunny found us on easter morning. 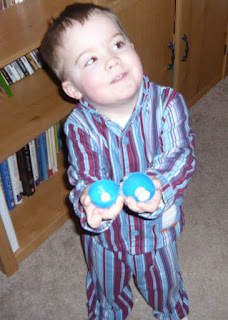 the boys had no problem spotting their easter baskets and the hidden easter eggs. 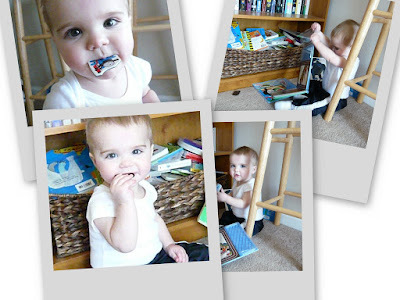 owen loved his new crayons, coloring book, little people video, and candy. 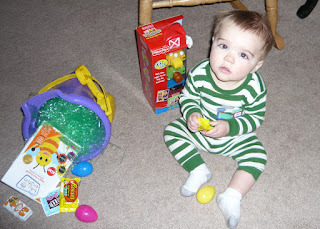 and wesley loved the easter grass, shaking the candy-filled plastic eggs, and eating the wrappers. 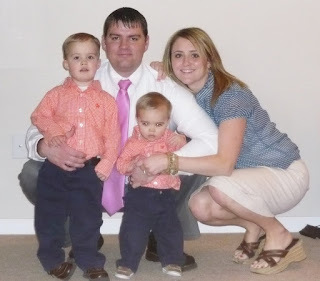 the boys looked so handsome at church with their matching orange gingham shirts. it's always so fun to see all the cute little kids in their new easter clothes. i am especially partial to little girls in their easter bonnets...too cute. owen had colored a picture of jesus in nursery and was so excited to show it to us and the first thing he told us was, "jesus has his body!". it made my heart melt. he has some great nursery leaders. and speaking of which...also at church today kevin and i were called to serve in the nursery. owen and wesley will LOVE that! our sacrament meeting was very enjoyable and was filled with some beautiful musical numbers. after church i had to race to get a picture of us together before the boys (including kevin) started ripping clothes off and devouring candy. this was the best we could get. later that evening kevin's sister, staci, came by with her friend kyle. it was nice to visit with them while they were in town. after the cute movie we all went to my parent's house for some dinner and pre-easter snacking. everyone brought delicious snacks and we enjoyed some great entertainment. 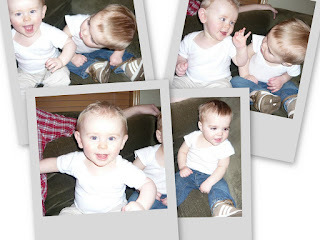 eli and wesley are about three months apart. we had them chillin' next to each other on the couch in their undershirts. i thought they looked so cute so i pulled out my camera...and that's when eli turned on the smiles. every time i pointed the camera he would give me the greatest smile. he loved it. in the pictures below you can see his adorable little mug, and you can also see wesley looking over at him wondering what the big deal was. too cute! 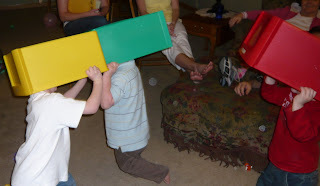 carter, ogden, and owen decided to play some full-contact sports in the middle of the living room. 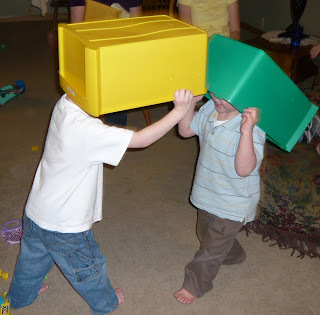 we all enjoyed the entertainment as they donned the toy buckets on their heads and began ramming each other around like a bunch of elk. so hilarious. carter walked away with a black eye, owen was rubbing his neck, and i am not sure what kind of damage ogden walked away with. all in good fun! 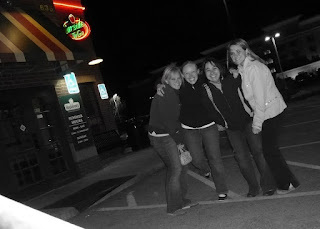 then, after the kids were in bed elena and i got away to applebee's to meet our friend elise and her sister caitlan for some late night appetizers and dessert. i love when we get together. it seems like we never have enough time to finish all the great stories we begin! oh well, we always seem to be able to pick-up where we left off at the next meeting! love you girls. saturday afternoon we met up with most of my family at edwards cinema in idaho falls to watch horton hears a who (cute show). 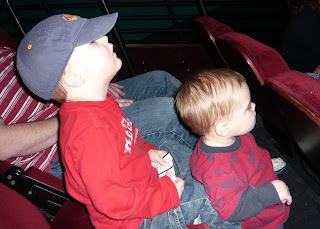 this was owen's FIRST visit to the theatre (that he remembers), and he was impressed! this was a picture i took of the boys during the previews and owen was GLUED to the huge screen. everyone was trying to capture his attention and offer him all kinds of treats and he didn't even bat an eye. he just starred for about 15 minutes with his mouth wide open. so priceless! 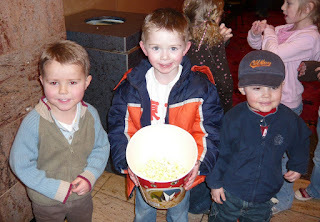 owen's favorite part about the whole thing was that his buddies ogden and carter were there. the best day ever! saturday morning we did the deed of dyeing easter eggs...and i have to admit that i had to call my mom to actually learn how to correctly boil eggs (pathetic). 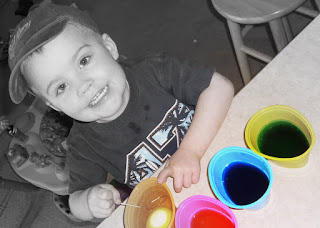 owen LOVED playing with the colored water but was very upset about having to put the white little eggs inside the bowls. 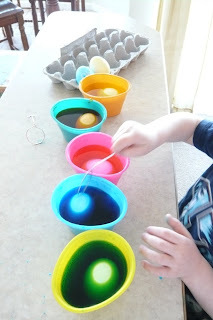 but, once i showed him how fun it was to color on the eggs with a crayon and then dip it in the water to see what it looks like he was totally on board. it's not easter until your house wreaks of boiled eggs and you have colored dye all over the counters. we love it! 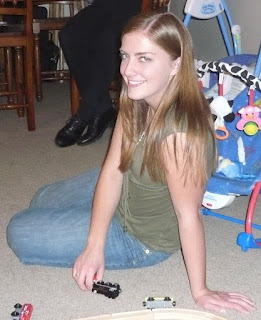 kevin's little sister, laura, turns 23 today! happy birthday laura! we hope you have some fun plans for celebrating today. we love you and hope to see you again soon...it's been TOO long! there isn't much that can top spending an afternoon with a girlfriend! 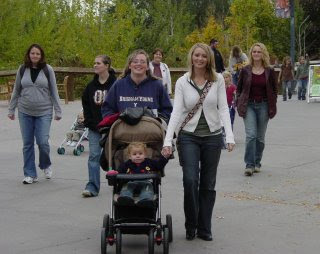 sure, we had our little kiddos in tow but we still had a wonderful time. 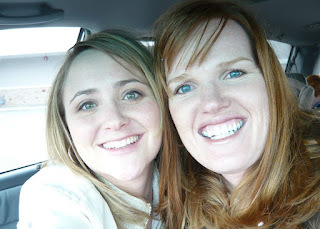 lisa, my old college roommate, was in pocatello for spring break and made the trek to idaho falls to entertain me for the afternoon. and boy can she entertain! we always have such a blast when we are together. i figured the last time we had our picture taken together was at my wedding luncheon so we pulled out the camera and documented the occasion. the first matter of business was to do what we do best when we are together...EAT! 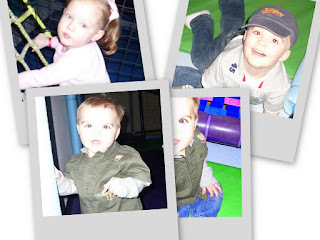 so we took the kids to leo's place for some salad, pizza, and endless fun in their play zone. 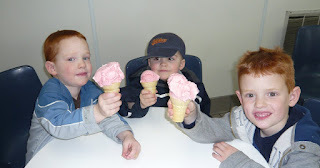 then we topped it off with some reed's dairy ice cream. it doesn't get much better! lisa, thanks for making the drive. i love spending time with you so let's do it again soon! cell phone in one hand, ice cream in the other. this doesn't look safe. okay. so every year during march madness i fill out a bracket with my hubby, kevin. i know NOTHING about any of the teams so i get a little assistance from kevin...but, the main reason i do it is to make watching all this basketball (that my husband loves) tolerable. and it actually makes the game watching quite fun, especially when my picks beat his picks. so...here are my picks for the final four. and i have unc and texas duking it out and unc taking it all. now bring on the basketball! i am cutting it close with this post...but, i had to be sure to put in my two cents before the show (american idol) tonight. amanda-i agree with simon. no element of surprise with her...so i think she will get old fast. she is a cool rocker chick...but, not very versatile. brooke-i love how she admitted she was an awkward dancer and that her weird "whooh" just came out...it actually made me like her even more. carly-i disagreed with simon on this one. i thought she picked an awesome song and she really wailed. loved it! chikezie-he has become very entertaining to me. i am glad he is still around. david a.-solid. he did a great job last night. david c.-i love this rocker guy. he is awesome to listen to, and even more fun to watch. jason-awkward to the max. much too folksy for me. 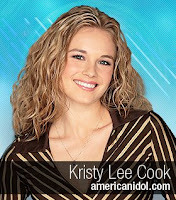 kristy-i thought last night was her best performance. and maybe it was just because she wasn't straddling the mic stand. michael-he really didn't pick a very great song. but, i still like him. ramiele-weird outfit, weird song. but, she has great vocals. so...who do i think is going home tonight? kristy...for the third week in a row. but, it really is a tough choice this time around. too many on the same level. ok. so i have to get this post done tonight while the show is fresh on my mind. i love that the guys and gals are performing on the same night now. NOW it feels like a real competition. and tonight's show down of mccartney/lennon songs reminded me how much i LOVED the movie across the universe. has anyone else seen it yet? amanda-she was cool tonight. each week she looks cuter and cuter. and unlike simon, i loved how she rambled/mumbled when she was rockin' it. brooke-she was cute on the piano. carly-she really rocked it tonight. loved everything about her performance. chikeze-i owe him an apology. i really enjoyed his performance tonight. he worked it out and he was fun, fun, fun! david a.-my heart stopped for him when he forgot the lyrics not once, not twice, but three times. ouch! i think he is running out of his previously performed songs and now it's getting tricky for him. hope he survives. david h.-it was rough. but, he's cute so he might be able to make it through the eliminations tomorrow. jason-he's a little too awkward for me. but, he could be cool. 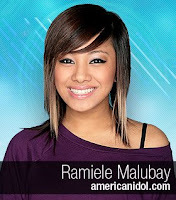 ramiele-she looked beautiful...but, boring...she's a goner. i just don't get why some people choose such slow boring songs. help me out here. our little owen. always keeping things exciting. here is how it all began this afternoon. owen comes running up to me and our conversation goes something like this. i proceeded to look inside his nose and find a d60 battery stuffed up his nostril. anyone who knows me well knows that i do not stay calm during stressful circumstances, and this time was no exception. 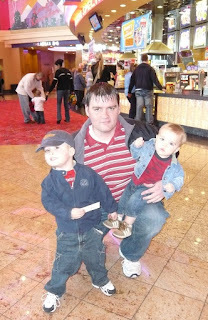 although, i did really TRY to have some composure this time...for owen's sake. i run to my room and grab my tweezers and proceed to try to remove the "foreign body" (as the doctor's later referred to it) but had no success. owen was squirming all over the place and it was only pushing the battery further up. then i try to get owen to blow his nose but that was no good because he has never been very good at blowing snot out his nose let alone a little round battery. i call elena, my sister-in-law, for some advice and she suggests that i try to get owen to blow a candle out with this nose. at this point, owen is becoming more and more anxious (no thanks to me) and so when i pull the matches out and strike it owen is screaming "no fire, no fire" because he's afraid his lunatic mother is going to light his nose on fire. two hours later and after a stop at a community care, my pediatrician's office, and kevin's "work", we find ourselves (kevin in tow) in the e.r. and owen is getting the battery removed with something that looked like an amniohook (a hook normally used to break your water when you are having a baby). luckily the procedure only took 10 seconds and after owen was able to take a few deep breaths he looked at the doctor and said, "doctor, thank you for taking my nose out." 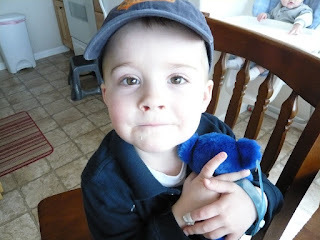 the doctor was pleased with owen's politeness and offered him a little blue teddy bear and four suckers. owen talked to and thanked each person in the e.r. room, referring to them all as "doctor". "doctor, i want to go home now." "doctor, i want to go home and eat my lunch and take my nap." he had them all wrapped around his finger by the time we left and they were all waving good-bye to him and waiting to hear his cute little responses. so, now that we are home and the boys are in bed we can laugh about today's adventure and hope it doesn't happen again. last saturday i had decided that i was giving up dr. pepper...but, that will have to start another day (...slurp...slurp)! 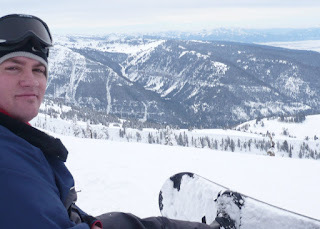 kevin's main event during spring break was spending all day friday at targhee ski resort with two of his buddies, adam and jared ullrich. they had a fantastic time. 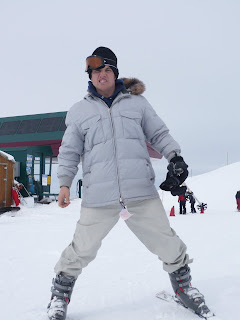 kevin got a new snowboard, boots, and bindings for his birthday and christmas last year and he hadn't used them yet...so, i was actually relieved that he was able to go before the season ended. hopefully he will make it out a couple more times this season. kevin having a seat while he takes in the view. 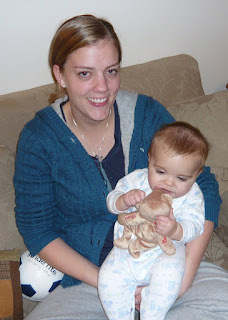 this week wesley had his first well-baby check-up with our new pediatrician in idaho falls. 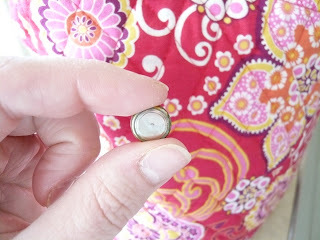 and we found out that wesley had only managed to grow 1 1/2 inches and gain 3 ounces in the last four months! this has moved him from the 75th percentile to the 20th. our pediatrician didn't seem too concerned but i am freaking out. he is healthy as can be and is smart as a whip. so why the growth stunt? any advice. our favorite way to unwind. 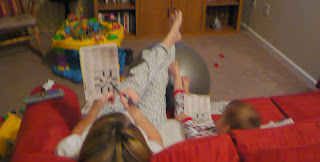 crossword puzzles. 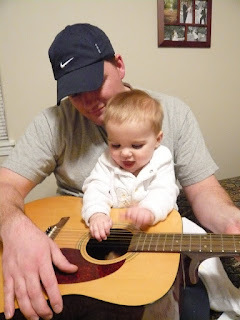 there are few things more irresistible than a guy playing on a guitar. but, here is one. 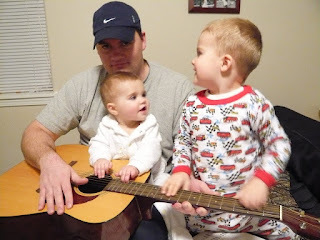 a guy playing a guitar with his adorable son(s) on his lap. this week in celebration of kevin's spring break (and with a little inspiration from guitar hero) kevin is dustin' off the old guitar. i think it has been years since he last played. so, we were all excited when he sat down and played around for a little while. hopefully it isn't another two years before he does it again....otherwise, good thing i documented this.